Today I have a very Canadian treat to share with you. Nanaimo bars! All the Canadians reading this are licking their lips, but the rest of you are probably going, huh? Nanaimo bars are a tray dessert made up of a crust layer of crushed graham crackers, nuts, coconut and chocolate, a filling of fluffy vanilla frosting and a chocolate topping. 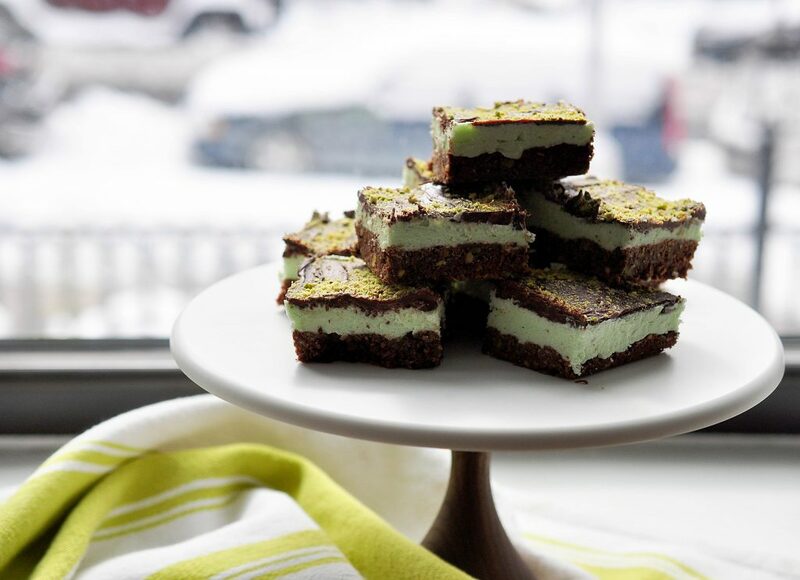 But I wanted to do something a little more special and a little more green (after all it is St. Patrick’s Day) so here is a recipe for pistachio Nanaimo bars! These lovely bars are a mainstay of the deli section at the grocery story and I used to beg my Dad to buy them for us. I didn’t actually try making them at home until adulthood. I remember the moment strongly—it was one of those great triumphant feelings of adulthood. I can make and eat them whenever I want?? Wow. 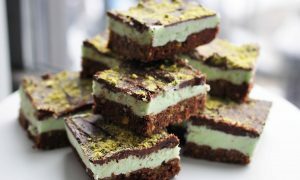 And yes it does use instant pudding mix (the original uses bird’s custard powder) and I’m sure that crushed pistachios and gelatin might work… but this is the slightly sleazy mid-century dessert we love, so just embrace it. Now of course these are major treats absolutely packed with butter and sugar, so while we CAN have them whenever we want, the other adult side of me says, let’s save these for special occasions. 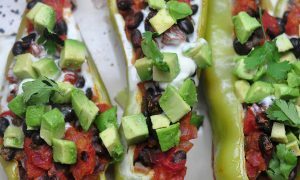 This recipe is adapted from the official city of Nanaimo (where the recipe originated) version and it makes a huge tray so if you make them, consider freezing half so they don’t get stale. They also make a great treat for a party. I love making them to surprise my American pals! 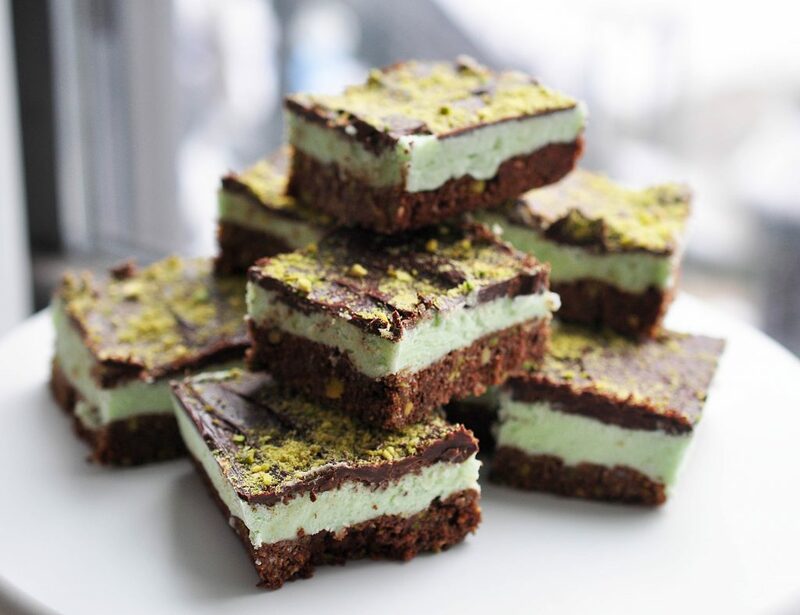 Pistachio nanaimo bars are a tray dessert made of a crust of crushed graham crackers, pistachios, coconut and chocolate, a filling of fluffy pistachio flavored frosting and a chocolate topping. Heat oven to 350 F. Butter or oil a 9” x 13” pan. Add all the ingredients for the crust to a bowl and mix until thoroughly combined. It will be a fairly crumbly mixture. Press the crust mixture into the pan as evenly as possible. Bake for 10 minutes. Remove from the oven and set aside. 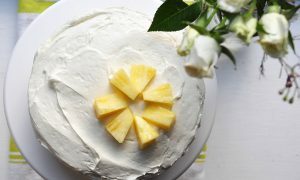 For the filling, use an electric mixer to beat the butter with the confectioners sugar and vanilla until light and smooth. Add the pudding mix and milk and beat until light and smooth. 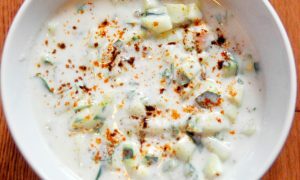 It might be a little bit loose at first after adding the milk, but keep mixing and it will become light, fluffy, and green. Spread the filling over the completely cooled crust and chill in the fridge until cold. 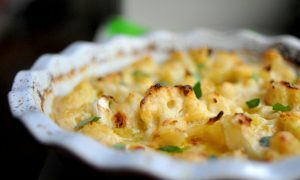 For the topping, melt the butter in a small saucepan on low heat. Add the chocolate and let it melt into the butter on very low heat, stirring occasionally until melted and smooth. Pour the topping over the filling in the pan and use a spatula to spread it as smoothly as possible—it doesn't have to be perfect. 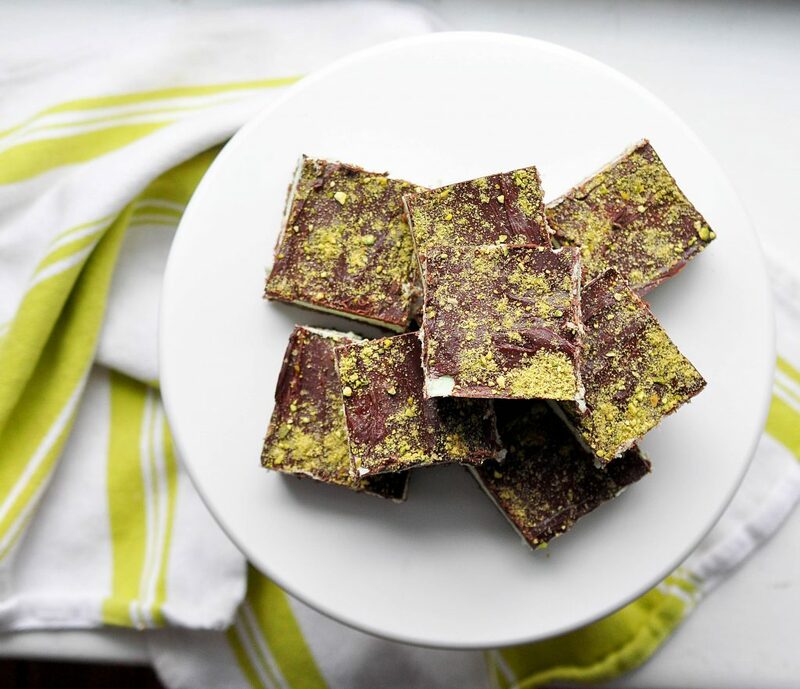 Sprinkle the 1/4 cup of pistachios (chopped as finely as possible, ideally in a food processor or coffee grinder) all over the chocolate to finish. Chill the bars in the fridge until they are set. Once set, cut into 48 small or 24 larger bars. Keep in the fridge. They get soft quickly at room temperature. They freeze well and make great gifts for friends and co-workers!